2019-04-24 Shop with confidence Secure online booking – guaranteed! Easter Special Offer: Book now for travel before 27 Oct 2019 & get a FREE Canal Cruise! See the beautiful Dutch tulips at largest flower garden in the world! Both printed or smartphone vouchers accepted! Feel as if you have stepped into a Dutch landscape painting when you take this delightful tour through rural Holland. You will save over 20% compared to the cost of buying these tours separately. Step back into history at the pretty village of Volendam and take a boat ride to Marken where people are dressed in traditional Dutch costumes and time seems to have stood still. Drive through picture-postcard Dutch countryside to Zaanse Schans with its photogenic windmills. Then discover traditional Dutch crafts when you visit a traditional clog maker and cheese maker. Perhaps pick up some souvenirs to take home. Enjoy a feast for the eyes at the glorious gardens of Keukenhof – the name actually means “Kitchen Garden” in Dutch, but don’t expect to find vegetables. In fact you will be treated to the world’s largest floral display. The sight will completely take your breath away! The 32-hectare park is planted up with no less than 7 million bulbs and is unbelievably beautiful in the spring, with carpets of crocuses, daffodils, hyacinths and tulips. Flowers delight, inspire and makes the world go round. 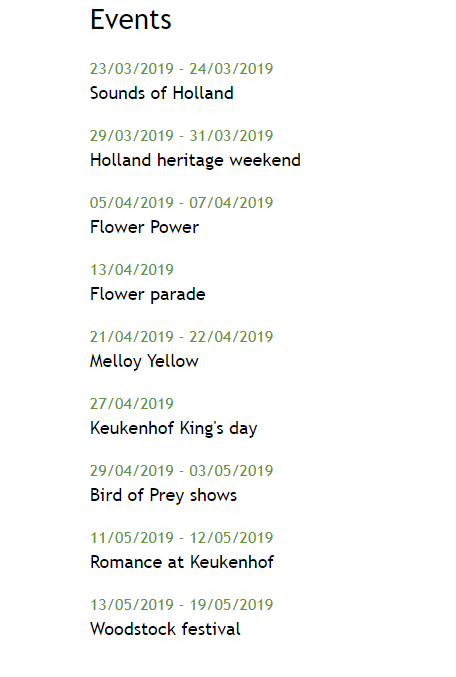 And in 2019, it is this ‘Flower Power’ that Keukenhof celebrates in its 70th year. It was in 1969 that the Flower Power movement brought hippies and music together to make peace and not war. Where can be a better place to celebrate the strength of the lovely blooms than Keukenhof. As part of the theme, you will see an additional 50,000 bulbs of the wonderful tulips, grape hyacinths and crocuses laid out. So this season, say it with flowers. Canal Cruise : 1 hour approx. Your super-value Volendam, Marken, Windmills & Keukenhof Combo Tour showcases classic Dutch countryside of windmills, polders and fishing villages as well as introducing you to one of the world’s most famous gardens. You will travel to the Ijsselmeer to see the pretty villages fringing the shore. Before the huge Afsluitdijk (Enclosing Dyke) was built in the 1930s these villages had access to the open sea and fishing was the main source of income. The old traditions of dress and customs lingered longer in these villages than elsewhere in Holland. Now, fishing has become uneconomic but the villages are preserved as historic treasures with attractive timbered houses on stilts and people dressed in traditional costumes. You’ll first visit the village of Volendam, then take a 20-minute boat trip (summer only) to the peninsula of Marken, where you will find charming green-painted houses and people in period dress. Re-boarding the coach, you will drive through classic Dutch countryside of polders and narrow dykes on the way to Zaanse Schans with its many windmills. Holland and windmills go together like the proverbial “horse and carriage”. Long ago, thousands of windmills were scattered across The Netherlands.Using eco-friendly wind-power they were used to drain lakes and reclaim land from the sea and they also processed wood for shipbuilding and prepared materials for the production of flour, dye, oil, paper and spices. As well as seeing the windmills you will have the chance to visit a traditional wooden clog maker. The Dutch have been wearing wooden shoes, or clogs, or "Klompen" since the Middle Ages. Originally, they were made with a wooden sole and a leather top or strap attached to the wood. Later, the shoes began to be made entirely from wood to protect the whole foot. Another item people always associate with Holland is cheese. On this tour you will be able to see for yourself how Dutch cheese is made in the traditional way. Next you will visit the glorious gardens of Keukenhof, (the name means “Kitchen Garden” in Dutch because the area was once a source of herbs for a grand castle). Keukenhof is also known as “The Garden of Europe” and the 32-hectare park is the world’s largest flower garden. Keukenhof is famous for its spring flowers – approximately 7 million bulbs are planted annually. Wander along winding paths past sparkling streams, blossom-filled trees, pretty ponds and a spectacular array of flowers. Don’t miss out on the 2019 theme of “Flower Power”, which has early 1970’s vibe. You will have nearly 3 hours to explore the delights of Keukenhof before boarding your coach for the return journey to Amsterdam. Please call the local activity operator at least 24 hours prior to the tour start time to confirm all details. Voucher information: No need to print! You can show your voucher on your smartphone or other devices. (But if you’d rather print a copy – that’s fine too!) This tour is a combination of two separate tours. The order of the tour may vary due to availability and clients might have to change buses in between. You can choose your preferred start time for Canal Cruise at Prins Hendrikkade 25, from 9:30am to 9pm upon voucher redemption.